When pictures began to come to life. What would our ancestors have thought of today's films? The people of New York City are being entertained this summer by the vitascope, which the Wizard Edison has evolved from his kinetoscope. The vitascope, in fact, may be called an enlarged and and improved kinetoscope. By means of it life-size pictures of human being and of nature which have been photographed by the kinetoscope are thrown upon a screen and given all the action they had when the scene transpired. One may see, for example, a procession of soldiers, or a street scene with cabs and trucks and people passing to and fro, or the waves rolling ceaselessly upon the beach; or the waters of Niagara as they flow over the falls and plunge into the abyss. The vividness and realism of these moving pictures is startling, yet the contrivance by which they are produced is comparatively simple. The vitascope consists of a small photographic lens, a metal frame about an inch and a half square over which the pictures pass just behind the lens, a larger lens behind the frame, and last of all, behind the large lens, an electric light of two thousand candle-power. The pictures which are to be produced have been photographed on kinetoscope films and are not larger than the little finger nail. To the number of several hundred, or until the scene has been sufficiently portrayed, they pass in rapid succession between the lenses, and are magnified six hundred times when thrown upon the screen. Mr. Edison is now experimenting with a view to combining the vitascope and the phonograph, so that the action of the scene may be perceived and the sound which accompanies it heard at the same time. The possibilities of the combined phonograph and vitascope are very great. Plays could be presented, sermons and lectures delivered, and performances on musical instruments given, with nothing lacking, despit the fact that the performers are remote from the place of representation. *Vitascope: A moving series of photographs, giving the appearance of a living picture. Unknown. "The Vitascope." Demorest's Family Magazine. September 1896. pg. 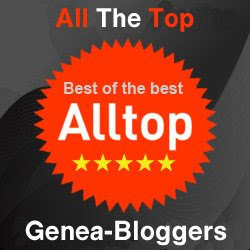 654. Unknown. 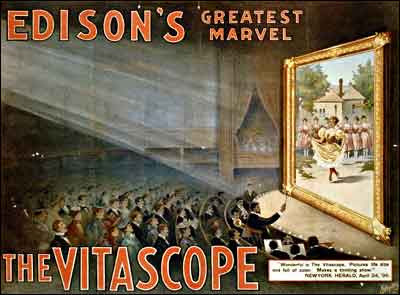 “[Edison's greatest marvel--The Vitascope. ]” Poster. New York : Metropolitan Print Company, c1896. From Library of Congress Prints and Photographs Division. (accessed July 9, 2008).